The Nexen N'Fera SU1 was the 2014 winner of the German IF Design Award thanks to this tyre’s asymmetrical profile and high performance. Another set of very good tires for me. Needles to say - no brainier. I am very pleased with quality and price and feel safe to drive around with family on local and on very long holiday trips. Highly recommended. I cannot comment on the longevity of this tyre at this point. It is however very quiet and the grip is excellent. There is very little difference in the tread pattern on this tyre and the original Continental Sport Contact 5's. And they are half the price! This is my second purchase of this tyre, 4 each time. I have done over 35,000 miles on them in 14 months. I can't fault them. The rating on them this time has changed? Last year they were an AAA? I am a car/tyre person and used to work in the tyre industry. I believe my fuel economy went up with these from the previous Khumo's, they grip well both wet & dry and no screeching noise when accelerating or braking. I recommend them; my size was a 255/35/19 so a big, low tyre. 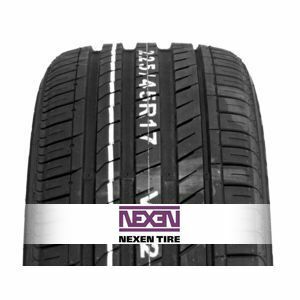 To review the Nexen N'Fera SU1, you first have to log-in by clicking here.